One of the recommendations of the Committee’s report is a re-definition of the RSC regions – but what impact will this have on schools and the RSCs? I’ve crunched the numbers to find out. The Select Committee report offers a detailed and thorough examination of the roles, responsibilities, capacity and impact of RSCs, and the extent to which this is well-understood and transparent. One of its key criticisms of the way in which the system has been established is the definition of the regions. These regions do not map onto any existing regions, most notably Ofsted’s. 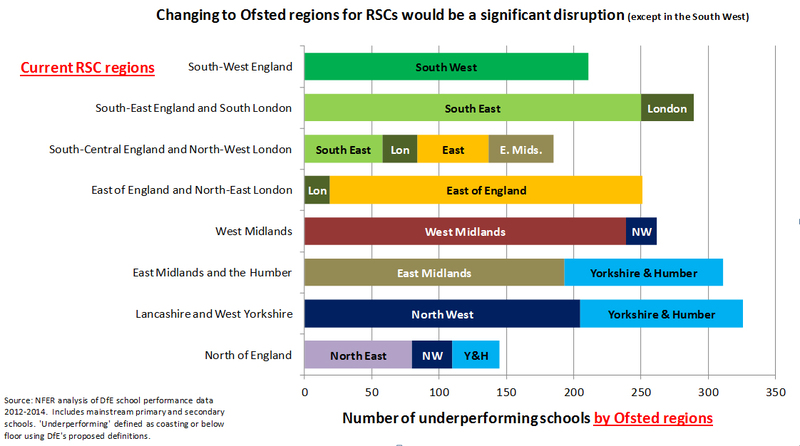 Indeed, the report points out that one RSC region (South Central England and North West London) incorporates parts of four different Ofsted regions, and Ofsted’s London region is split between three different RSCs. On the basis of the evidence gathered (including from Ofsted, the Greater London Authority and the RSCs themselves), the Select Committee has therefore recommended that the regions are re-defined. Instead of the current eight RSCs, there would be nine RSCs, each responsible for a region that aligns with Ofsted’s. In future, it suggests, there could be further changes in line with regional devolution (such as in Greater Manchester). The Committee’s recommendations arise primarily for operational reasons: to enable closer linkage with the different local and regional bodies. However, these changes would also have an impact on how the workload is distributed between RSCs. The report has drawn on NFER analysis which revealed the wide variation that already exists. For example, we estimate that the number of underperforming schools ranges from 145 in the North of England region to 326 in Lancashire and West Yorkshire – i.e. the RSC for the latter region potentially has double the workload. So, will this variation reduce or increase if the government choose to accept the Committee’s recommendation? In last year’s analysis we used the government school performance data to estimate how many schools in each RSC region will be deemed underperforming under the proposed floor and coasting school standards. I have used this same analysis (based on school performance in 2012, 2013 and 2014) to consider what the picture would be under the Committee’s proposals. The first thing to note is that the change would be significant. 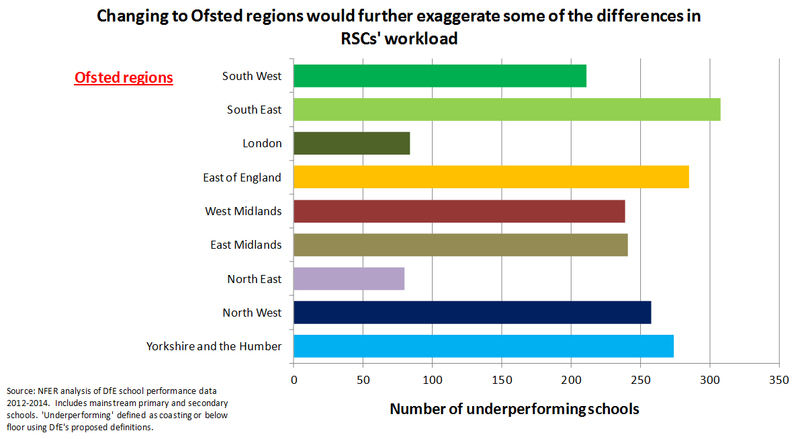 The chart below shows my estimates for how many underperforming schools there are in each existing region (horizontal bars), and how these would be redistributed across Ofsted regions (colour coded). What’s clear is that this would not just be a few tweaks around the edges. Large numbers of underperforming schools would come under the jurisdiction of a new RSC. The Select Committee found a lack of consistency in the approach adopted by different RSCs, so this could create added pressure and disruption to schools already in difficult circumstances. This would also present challenges from the RSCs’ perspective. One of the intended benefits of the regional system is the local knowledge and relationships developed by RSCs and their teams. Such a major change to the regions would put this in jeopardy, or at the very least mean that some of the progress over the past 18 months needs to be re-made. The second challenge presented by the suggested changes is a further exaggeration of the differences in workload between the regions. On the positive side, as you would expect from increasing the number of regions by one, there is a slight reduction in the workload of the most challenging region (down from 326 schools in the current Lancashire and West Yorkshire region to 308 schools in the South East Ofsted region). However, there is a much greater reduction in the expected workloads of the highest performing regions (with just 80 underperforming schools in the North East and 84 in London). This variation is not necessarily a problem, however it would imply substantially different levels of resourcing between RSC regions. This is likely also to translate into different staffing structures, degrees of specialist expertise, and approaches to working with schools – risking adding to the inconsistencies of approach the Committee identified. It will be important, if changes are made to the regions, that these issues are fully taken into account when staffing, resourcing and managing the RSCs and their teams. In conclusion, I can see a lot of sense in better aligning the RSC regions with existing boundaries, particularly Ofsted’s. However, the implications of making such changes should not be underestimated, especially at a time when many – from classroom teachers to Sir Michael himself – are weary of changes to school structures.